OMG am I so happy. Carols stitching is perfect as is her choice in gift for me. Mixing a bit of Vintage Modern with Anni Downs, always a winner. Christmas gift from me is. Fingers crossed she likes it. Wow that is gorgeous Sharon!! ... Yes, tomorrow will be quite busy, what with children and all :) Happy Christmas!! 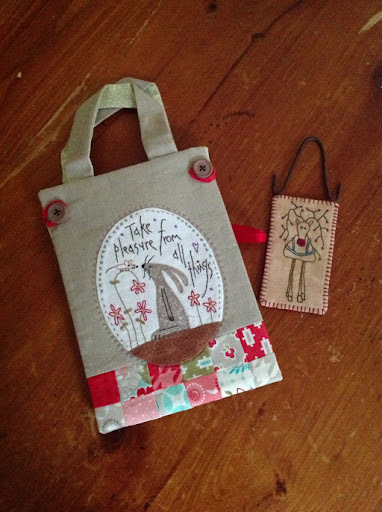 That is such good karma, Carol has done lovely work on the project bag. And her decoration is so cute, I have that little reindeer on a swag pattern. Enjoy your day tomorrow, hope the kids don't get you up too early. A beautiful gift Sharon, enjoy. Good idea to take 5 mins for yourself and open something just for you. 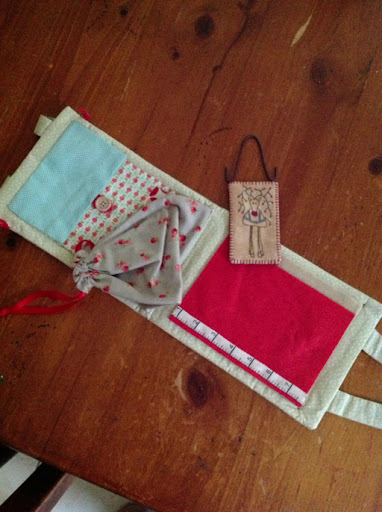 Carol's gift is as beautiful as the one you made for out Mill Rosie gathering. So wonderful that you received such a gorgeous version. Christmas wishes to you and your family, have fun tomorrow! Wow! That is gorgeous. :D What is the pattern? What a fabulous gift. Love it. Merry Christmas to you.